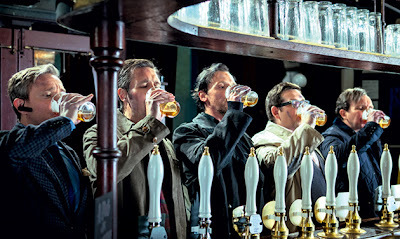 There is a sequence in The World’s End where a desperate man with nothing to lose makes a decision in the face of an imminent threat to finish something that finding a fulfilling life depends on, prompting his former best friend and a man who he has been at odds with the entire night, to realise that he needs his wingman back. The emotion that holds is quite something. Embedded within this pilgrimage of middle-aged inebriation and reminiscence is a moving tale of friendship. Simon Pegg and Nick Frost never lose sight of this dramatic human conflict in their films and with Edgar Wright’s extraordinarily natural abilities as a director, their return to the screen explodes with as much as energy as their preceding cult hits Shaun of the Dead (2004) and Hot Fuzz (2007). The World’s End is the third and final chapter in the team’s ‘Three Colours Cornetto Trilogy’ and is bursting with witty dialogue, full-throttle action and playful genre nods, to the level we have come to expect from the gifted trio. Gary King (Pegg) is a self-centered man in a state of arrested development. Having recently been in rehabilitation for substance abuse, he becomes obsessed with re-attempting the infamous Newton Haven pub-crawl known as The Golden Mile. Twelve pubs. Five guys. Sixty pints. He resolves to convince his now-estranged childhood friends – Andy (Nick Frost), Steven (Paddy Considine), Oliver (Martin Freeman) and Peter (Eddie Marsan) – to return to their former hometown and join him on the quest they gloriously failed to complete on their final day of school. While his friends have all built for themselves prosperous adult lives, Gary has not grown up, remaining as crass, impulsive and immature as they remember him. But sensing his desperation they feel concerned for him and agree to come along. After sinking a few ales and meeting up with Oliver’s sister, Sam (Rosamund Pike), they begin to suspect that there is something suspicious about Newton Haven. For one, they are not crowned the prodigal sons, curious news to town legend Gary. As the past and the present collide over the course of the night, it becomes the future that lies in the hands of their successful odyssey. Differences have to be put aside, and if these guys are to make it they have to keep their heads.